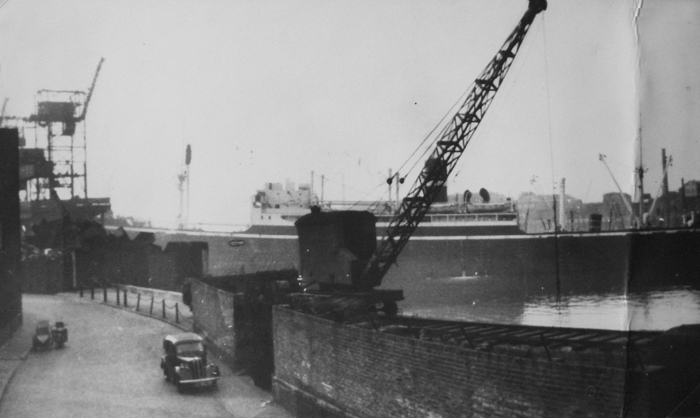 Union Wharf in the 1958 surrounded by a high wall and with a steam crane on rails on the quayside. The ship in the background had run aground at Anchor Iron Wharf and drifted on the tide to block the river. 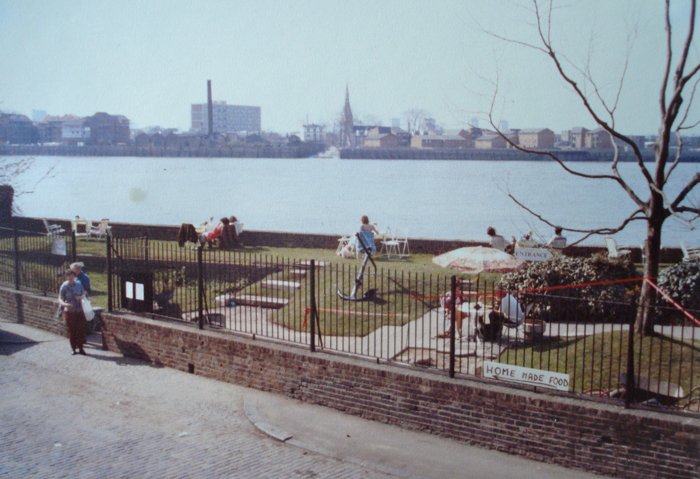 Union Wharf Garden when it became a tea garden in 1985. 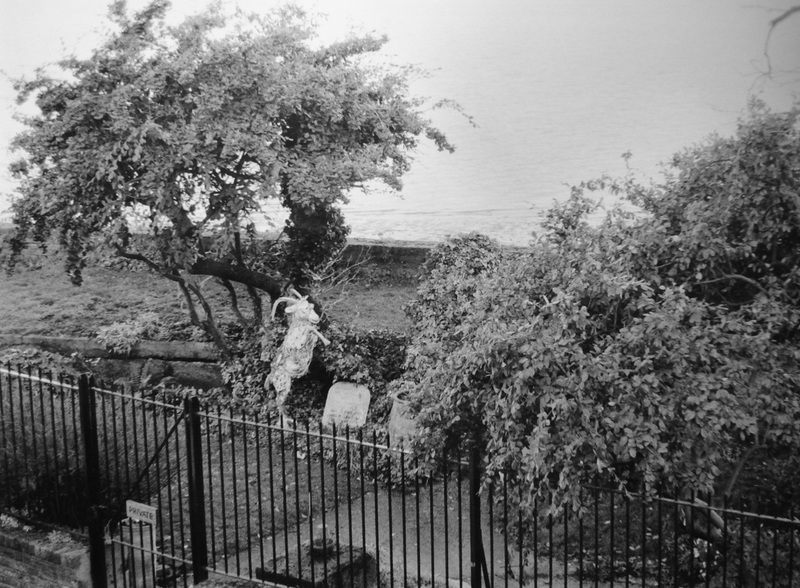 Morden College had demolished the wall and enclosed the Wharf with iron railings, opening up a view of the river to residents and passers-by. The garden we know and love today was created in the 1960s by Hilary Peters on the former industrial site known as Union Wharf. This wharf has been owned by Morden College since the beginning of the eighteenth century when Sir John Morden bought the East Greenwich Estate from the Crown to endow his almshouse on Blackheath. Morden College flourishes to this day and still owns this wharf. In 1800 the Wharf and the street, formerly known as Ballast Quay, changed its name to Union Wharf in commemoration of the Union of England and Ireland. In the mid 1850s the Thames Conservancy built the Harbour Master's Office overlooking the wharf in order to monitor the activities of colliers bringing coal to fuel London's industry. Master's Office and the approach to the wharf and have survived to this day. When the Port of London Authority was formed at the beginning of the twentieth century, the post of Harbour Master for this reach was abolished but the wharf was kept on as Port of London Wharf. From the 1920’s the wharf was used for general import and export by Lovell’s Wharf next door. By the mid-1960’s the wharf was was largely disused and derelict and full of rubbish. The wharf was surrounded on the landward side by a high wall and there was a steam crane which ran along the wharf on rails. Hilary Peters discovered it, saw its potential and persuaded Morden College to lease it to her, together with a house overlooking it. 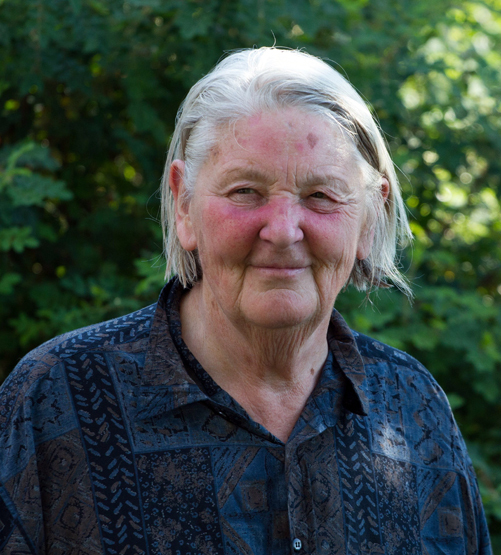 She made it into a garden for the use of the neighbours, and ran her business from it. Union Wharf Nursery Garden created the gardens at St Katherine’s Dock, based on the idea of plants growing out of cracks in the concrete - the wild returning to the derelict inner city. Surrey Docks Farm grew out of a neighbourhood scheme started here. In the 1980s the wharf had a brief career as a tea garden, managed and run by the neighbours. It was very successful and became a destination for walkers along the Thames Path. 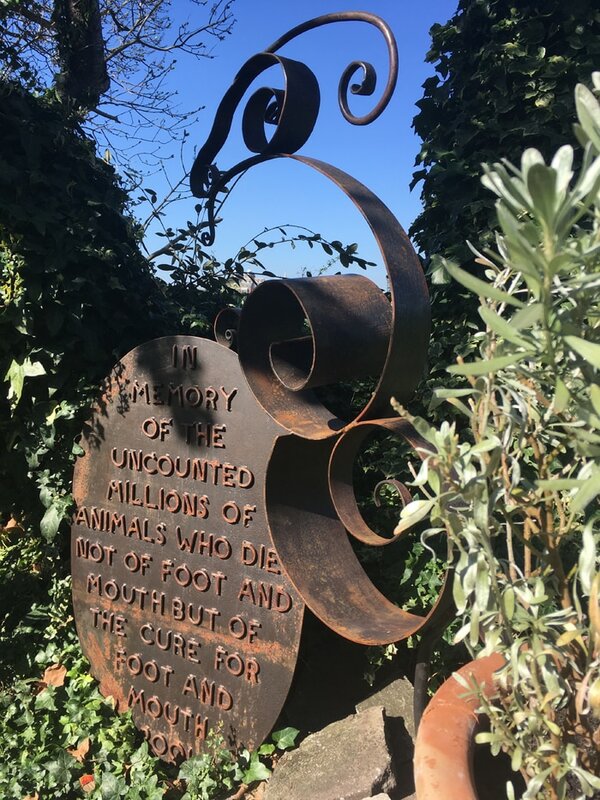 The memorial to animals killed in the Foot and Mouth disaster of 2001, fast becoming a memory, is by sculptor Kevin Herlihy. The wharf is still owned by Morden College and leased by Diane Greenwood who generously maintains and plants it for the pleasure and enjoyment of the neighbours of Ballast Quay and their visitors. She hopes it offers a taste of the wild in an urban landscape. In the 1960’s, the whole area was a concrete jungle of working wharves, shipping, lighterage and cranes. The garden represented the first sign of greenery re-emerging from the industrial age. 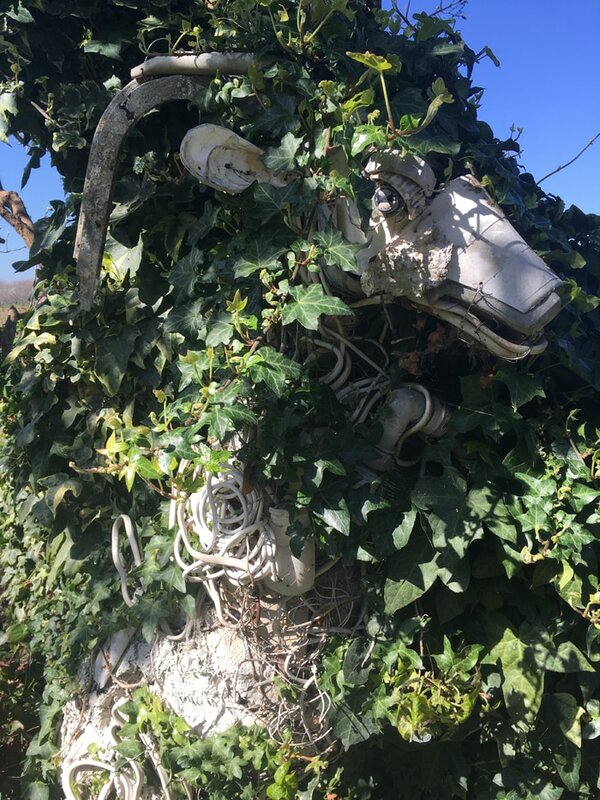 Now there is no industry, the plants have established themselves and the garden shows how roots can break up even the hardest surfaces and nature can take over once more. In this video Hilary Peters talks about finding the derelict Union Wharf in the early 1960s, creating the Ballast Quay communal garden on the site of the former industrial Union Wharf, which she discovered In the 1960s, when the whole area was a concrete jungle of lighterage and cranes. The garden heralded the re-emergence of green shoots in a historic industrial landscape.